In May 2015, Gary, a 42 year old professional golfer, had a fall from his bike. He had no obvious injuries except for some shoulder pain the following day. A few days later, whilst in the pub with friends, Gary collapsed. He suffered a severe stroke, paralysing his left side. In hospital he underwent a decompressive craniectomy (removal of part of the skull to allow room for the swelling of the injured brain). Three months later Gary was transferred to Chapel Allerton Hospital for rehabilitation, and at this time he was dependent on a hoist for all transfers and needed assistance for all personal care tasks and activities of daily living. In November 2015 Gary had further surgery, a cranioplasty, to replace the skull which had had to be removed. By Christmas of 2015 Gary was still requiring the use of the hoist for transfers and used a wheelchair for all mobility. At the end of February 2016 Gary was admitted to Daniel Yorath House (DYH) in Leeds, where Charlotte Bamber was providing physiotherapy cover, to continue his rehabilitation. When Charlotte first assessed Gary he presented with global left sided weakness, left foot drop, altered sensation, no active upper limb function and was only able to take a few steps to transfer from bed to chair using a walking stick, but was unable to walk even as far as the bathroom without support. He reported his transfers to be slow and effortful, and needed a wheelchair for all other mobility. He was unable to ascend or descend stairs. His confidence when walking was reduced due to fear of falling, the risk of which was significantly increased by his left foot drop. He also had shoulder pain on movement of his left arm and also due to poor positioning. Gary told Charlotte his goals included improving his walking ability and being able to use his left arm. At DYH Gary has been working with a multi-disciplinary team including physiotherapy, occupational therapy, speech therapy and psychology. In physiotherapy we have used hands-on facilitation, exercise and technology (FES) to maximise Gary’s rehab potential. Treatment sessions have focussed on improving Gary’s posture and alignment, providing improved sensory feedback to his left side, and enabling increased activity of his left trunk, arm and leg. In April Gary told Charlotte he had decided to set himself a challenge, as part of Brain Injury Awareness Week. He wanted to do a sponsored walk… of almost a mile! 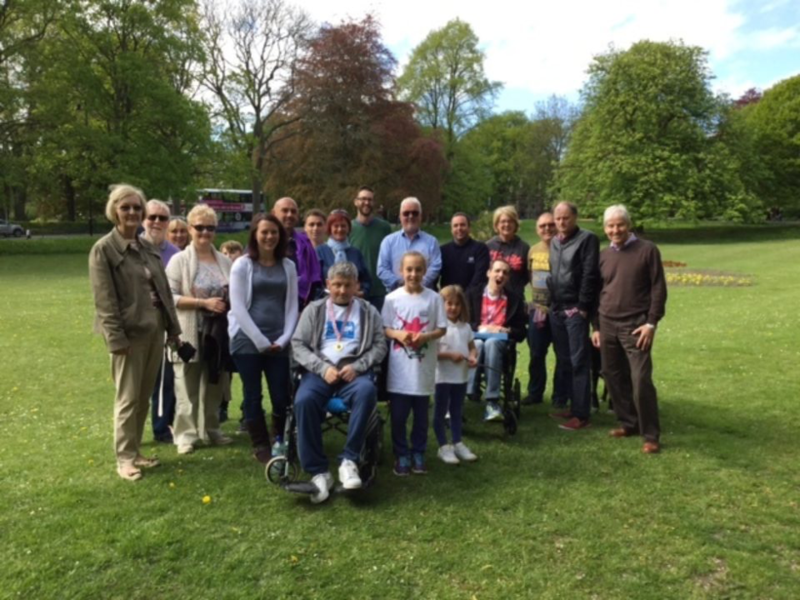 And on 14th May 2016, watched by many of his friends and family and members of his rehab team, Gary completed a 1.3km walk (including hills!) at Roundhay Park, raising more than £3300 for The Disabilities Trust in the process. 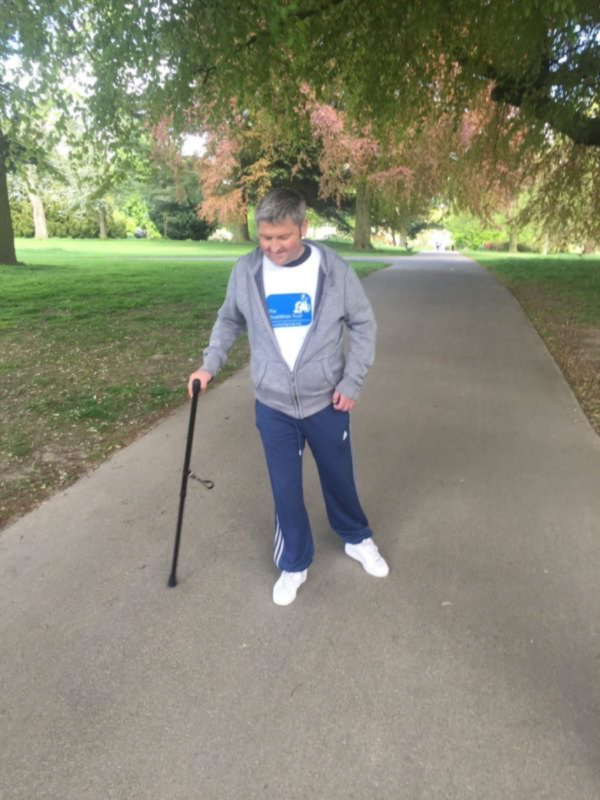 In the space of ten weeks (eleven months after his initial injury) Gary progressed from being only able to transfer from bed to chair to walking around the park, proving that it is never too late for rehabilitation to help you achieve your goals. Gary continues his rehab at DYH and has recently visited his 2nd floor flat, managing the stairs with a little support from his physio and OT! He is now looking forward to getting home and with a bit more physiotherapy we hope to see him return to the golf course!